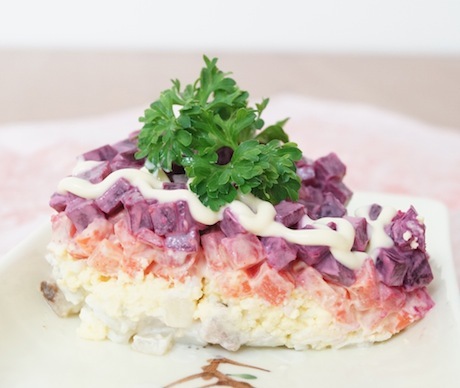 A legend names one Anastas Bogomilov, a merchant who owned several pubs in Moscow and Tver, as a person who came up with this dish. In 1918 Anastas became concerned that his clients got too drunk, too often. The drunken parties were usually followed by heavy fist fighting that kept destroying Bogomilov’s china, windows, and furniture. One of his chefs, Aristarkh Prokoptsev, came up with a brilliant recipe to solve this problem. He took salted herring, which symbolized the proletariat, potatoes symbolizing the peasantry, beets, whose red colour symbolized blood and the Bolshevik flag, and topped it all off with the French sauce Provençal. He named his new invention “ShUBA,” an acronym for “Shovinismu i Upadku – Boikot i Anafema”, or “Death and Damnation to Chauvinism and Degradation,” which coincidentally spelled the word “Fur Coat” in Russian. Bogomilov debuted this dish on New Year’s Eve of 1919. All guests enjoyed eating it very much, and even though they drank plenty of vodka, the new dish helped them get less drunk and, therefore, fight less. Over the years Shuba grew more and more in popularity. Its name changed to “Herring Under the Fur Coat,” and Provençal was replaced by mayonnaise. 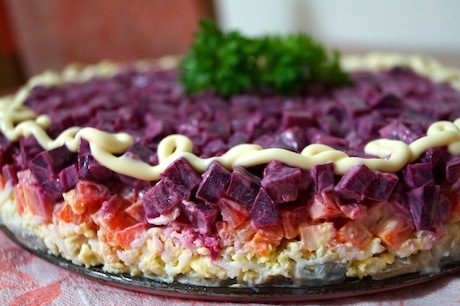 But for the first few decades of the Soviet rule, mayonnaise was hard to come by, so only very few of the political and cultural elite could make the “Herring Under the Fur Coat,” making this dish a status symbol of the sorts. By the second half of the 1960s USSR had finally set up mass production of mayo, propelling Shuba and other mayo-based dishes to mass popularity. To this day, Shuba is one of most popular dishes, especially in the winter and is an absolute staple for the New Year’s Eve menu. It’s not easy to guess its taste from reading these instructions, but I invite you to take a risk and make it anyway. Happy eating and a Happy New Year! You can buy whole or fillet salted herring in any Russian grocery store. They usually keep them in large wooden or plastic barrels. I strongly recommend that you use the whole fish from a Russian store, because other herring products in North American supermarkets have a different texture and different seasonings, which will change your Shuba’s taste. My favourite spot in Vancouver is the European Delicatessen on the corner of Burrard and Davie Street (1220 Davie Street) or Gastronom European Deli in Richmond (Suite 157-4800 No. 3 Rd). I’ve seen terrible Soviet-style customer service in other Russian stores in Vancouver area, but both the European Delicatessen and Gastronom are cozy little neighbourhood shops that are worth your trip, and not just for the herring. Bring water to boil in a large pot. Add salt, potatoes and carrots. Cook until a fork or knife can easily pierce the vegetables. Separately boil beets in salted water until a fork can easily pierce the root. Dice the onion. Pour boiling water over the onions and let stand for 1 minute. Drain water and add 4 tablespoons of vinegar, 1/2 teaspoon salt and a dash of sugar. Mix well and let marinate for 15 minutes. Prep and fillet pickled herring. See instructions below. Dice herring fillets and potatoes into small cubes. In a mixing bowl combine herring, potatoes, onions without the marinade, and 2 tablespoons mayo. In a casserole dish arrange the potato mixture into an even layer. Using a fine grater, grate eggs over the potato mixture. Using a fork gently arrange the eggs in an even, fluffy layer. Draw a thin mayonnaise grid over the eggs. Dice carrots into small cubes. In a mixing bowl combine carrots, 1-1.5 tablespoons mayo, salt and black pepper. Arrange the carrot mixture over the eggs. Dice beets into small cubes. In a mixing bowl combine diced beets, 1 tablespoon mayonnaise, salt and black pepper. Undersalt this last layer. Arrange the beet mixture over the carrots. Cover the casserole dish and let marinate in a fridge for at least two hours before serving. Garnish with parsley. Serve as an appetizer or a side dish for any second course meat dish. Herring has many bones, but removing them is not as difficult as it may seem. Even if you miss a few thin bones, no one will notice them in the end. 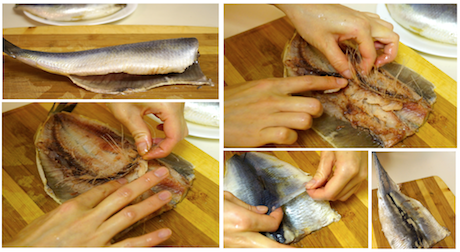 To fillet salted herring first remove guts, then rinse the inside of the belly with water. Gently pull the fillet apart, while pulling the spine out. The largest bones should get pulled out at the same time. Turn the fillet over and slide your fingers between the fillet and the skin. Gently loosen up and pull away the skin with your fingers until it comes off completely. Using clean tweezers pluck out as many of the small bones out of the fillet as you can. One herring takes about 5 minutes to fillet.